Not to overwhelm you, but there are literally hundreds, if not thousands of options on Zazzle. It didn’t start that way, but it has done some serious growing over the past few years and now it is shocking what you can make. Amidst all the options, I’ve done my best to highlight the easiest, most profitable, and coolest products to focus on. Before I get started on my list, I want to provide a quick overview for those new to Zazzle. Basically, the site allows you to upload images (either photographs or creative designs) and put them on different products that you post for sale. The site is completely free and they walk you through how to make each and every product. The greatest part of Zazzle is that they handle all the heavy lifting (and they should because they keep a portion of each sale), so you don’t have to deal with any customer service or fulfillment. You only worry about product design and marketing (and even that is only if you opt to – Zazzle is pretty awesome at marketing your products for you). 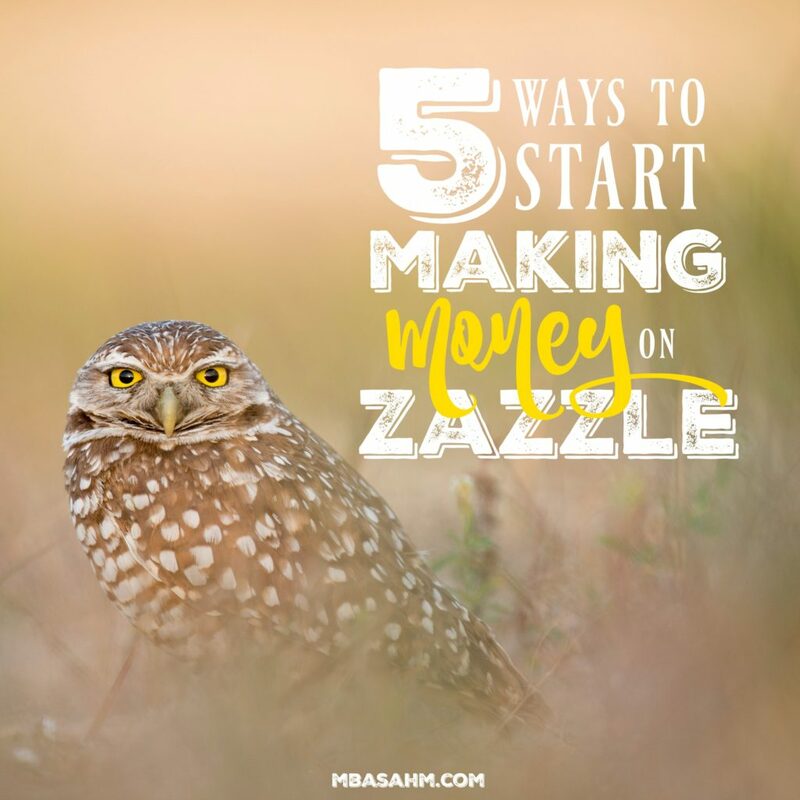 When you make a sale, Zazzle will notify you and your payments start accruing right away! After you reach their threshold ($50), your money is transferred into you bank or Paypal account. Unless you’ve been living under a rock, you know that the wedding industry is a billion dollar behemoth with tons of STUFF involved. Luckily Zazzle is no fool, so there are tons of wedding product options that you can create and turn into stunning collections. I wrote a whole article about how you can do this and what products you should focus on, so if this is your thing, check out my article here. One cool thing about wedding collections is that you can use photography or graphic design. And as I said before, there is a TON of stuff involved in weddings, so you can really think out of the box here. I sell a ton of customizable wedding gifts like Christmas ornaments, cutting boards, and pillows, so don’t stop with just the obvious. Of all the products I have made on Zazzle, invitations remain to be my consistent top seller. So if you have a design that is wedding-worthy, you need to turn it into a collection. There is one thing that will always sell – humor. If you’ve got a knack for one liners, then you could make a bundle selling funny T-shirts! I spend a lot of time on Zazzle forums and it is very clear that the T-shirt business is huge…and the funny T-shirt business is especially popular. So if you’re a comedian on the inside, put your thoughts on a shirt! If there was one product I wish I could focus more on, this would be it. One expert tip I will give you for making T-shirts – Use a site like PicMonkey that will let you create an image with a transparent background. Then, you can not only upload your design to different products, but you can also let your customers customize the background of their shirt. Believe it or not, Christmas ornaments on Zazzle do sell throughout the year. However – the amount you sell during the holidays makes it more than worth it to focus a lot of time on this one product. In fact, this is one of the first products I create when I start working with a new image. Here’s the key – figure out a way to make your ornaments personalized for each and every person. Maybe it’s a way to remember a great vacation, or to commemorate a major life event (back to the wedding collection! ), or a new addition to the family. And do not fool yourself into thinking that these need to be Christmas-themed. My best-selling ornaments are either bride and groom focused or travel-themed. Vacation photos are another major opportunity for a whole collection and tend to be photos that you’re taking already. I have an article that focuses specifically on vacation photos that you can read here, but the basic idea is to pick out high quality photos and use them to create postcards, magnets, and prints. My absolute favorite part of vacation photos is that it helps to cover travel expenses! It’s also such a great way to document your travels and keep the memories alive. As far as earnings go, there’s something very special about business cards – you will gradually develop repeat business! This is fairly unique as far as Zazzle goes, so it’s worth trying to incorporate them into your portfolio. Most business cards utilize graphic design, but almost all of my sales are from photography, so don’t count that out. It’s also great to know that somewhere a small business is utilizing your design! There is so much more to know about Zazzle, but as far as products go, this is where you should start. Good luck! If you’re looking for other ways to earn some extra money, check out my Pinterest board on Working from Home. I try to keep it updated with all the tips I can find! Follow MBAsahm’s board Working from Home on Pinterest. I have been on Zazzle since 2008 and 80% of my cards are made from my photography ! My products are also made from my photography for the main part!! I am so glad that I don’t have to depend on this for an income but it’s nice for some extra spending money !!!!! I think you just solved one of my business problems. Thank you so much. I was looking for an online solution that would allow me to not be responsible for shipping and storing products. Thanks again. You’re so welcome! I hope it works out! This is the kind of thing I’m usually very careful about. If you do use a picture from a theme park, you may not want to label it with the theme park’s name. Otherwise you could get into some copyright issues. I’ve also had this issue with college campuses. Best to be careful, but Zazzle is also really good about catching these things so you will be notified pretty quickly if there is an issue. Um, do you happen to have a Zazzle 101 post? Because I’m kind of confused about the whole picture and design thing. Is it really that simple? I really need to consider trying this out! These are good tips! I have a few items on Zazzle and am beginning to understand the potential. I enjoy sending greeting cards with my travel photos to friends. With this inspiring post, I’ll try my hand at making some postcards with photos from my recent trips. Thanks! Thanks so much for sharing! I haven’t used zazzle before but I think I’ll check it out now. Seems like it could be a great way to earn passive income. I love the business cards idea!